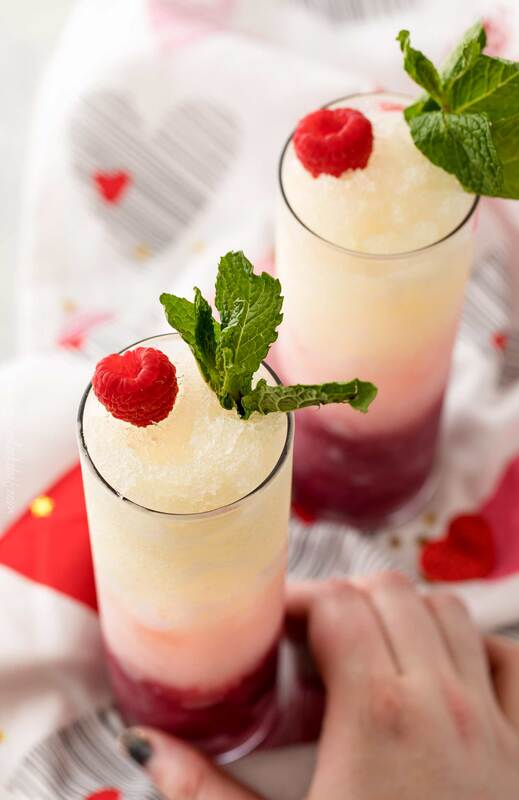 Three types of sweet wines are blended with simple syrup and layered together in a fun ombre pattern that’s perfect for Valentine’s Day or Mother’s Day. These sweet wine slushies are soon to be your new favorite! Do you love wine? Do you love slushies? Why not combine the two! The layered ombre pattern is perfect for a variety of occasions, and the sweetness is totally customize-able! I’ve been wanting to share this post with you for 2 weeks, and I’m just getting around to it. Here’s why. I literally dropped my camera in a slow cooker full of soup. For real! I was shooting a slow cooker potato soup for The Chunky Chef and doing an overhead shot. My tripod arm was horizontal with the camera locked on… or so I thought. The tripod lock failed and my camera and lens plunged down into hot, thick potato soup. Definitely one of those “omg I can’t believe that just happened” moments. So I was without a camera for a little while, although I’ve now upgraded my camera and was finally able to get these slushies shot! 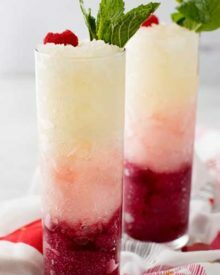 Making these wine slushies are simply amazing, and honestly SO easy!! It does take a little prep work though. The day before you want to make them, just pour the wine into ice cube trays and freeze until solid. 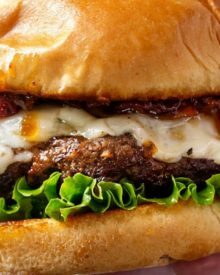 Then when you want to make them, just blend them, layer them, and enjoy! Yes! It doesn’t freeze as hard as water, as it freezes at a lower temperature due to the alcohol, but it will still freeze into cubes. Use sweet wines. I used a sweet red, pink moscato, and riesling (regular moscato works amazingly as well). For an even sweeter drink, make a simple syrup, cool it, and blend the wine cubes with a bit of the syrup. No need for multiple blenders. Just start with the lightest wine cubes, and work your way down to the darkest. 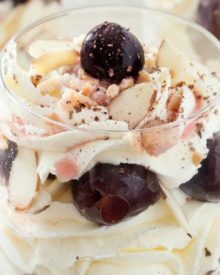 Put the blended wine into separate bowls and spoon the wine into your serving glasses. The garnishes are totally optional here… I just loved the way the raspberry looks a little like a heart! Due to the colors, these are obviously perfect for Valentine’s Day or Mother’s Day, but they are so good, you’ll want to have these year round! Blender – No need to break the bank here, but you also want a powerful blender. 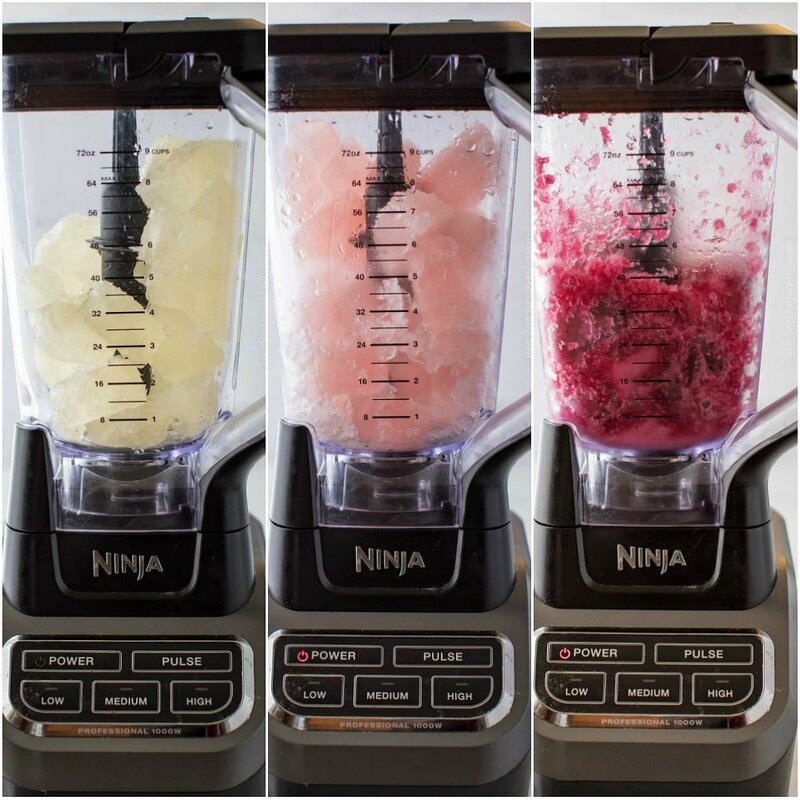 This Ninja blender has been a true workhorse for me over the years and breaks up ice like a charm! 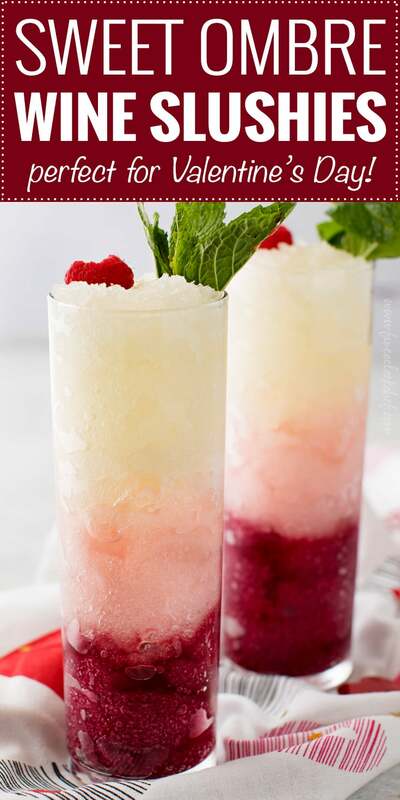 WANT TO TRY THESE OMBRE WINE SLUSHIES? PIN THEM TO YOUR DRINKS OR PARTY BOARD TO SAVE FOR LATER! Pour red wine into 2 clean ice cube trays. Pour pink wine into 2 other ice cube trays. Pour white wine into 2 more ice cube trays. 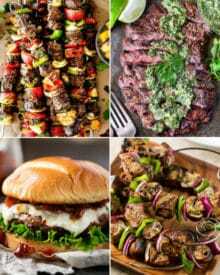 Place all trays in freezer and freeze several hours, or until frozen. Add white wine cubes to blender and process until blended to slushy consistently. Scoop into a bowl. Repeat with pink wine cubes, and scoop into another bowl. Repeat last time with the red wine cubes and scoop into one more bowl. Spoon red slush into the bottom third of serving glasses. Spoon pink slush into the second third of the serving glasses. 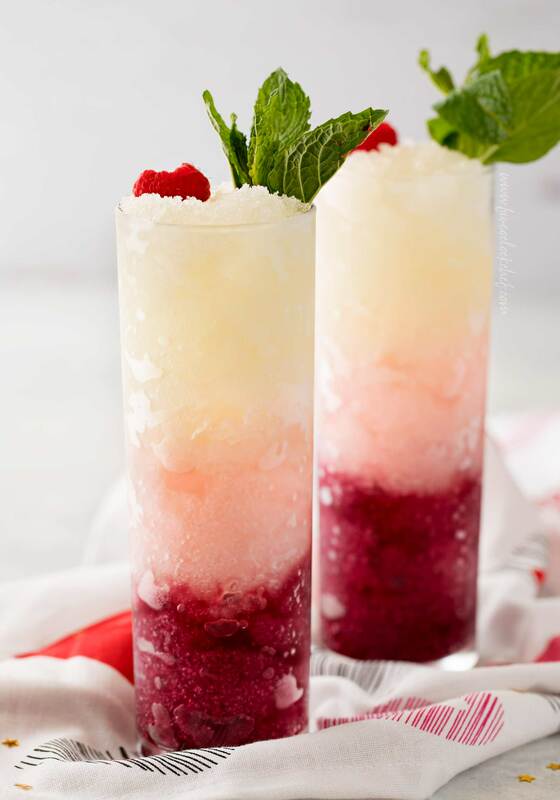 Top with white wine slush. 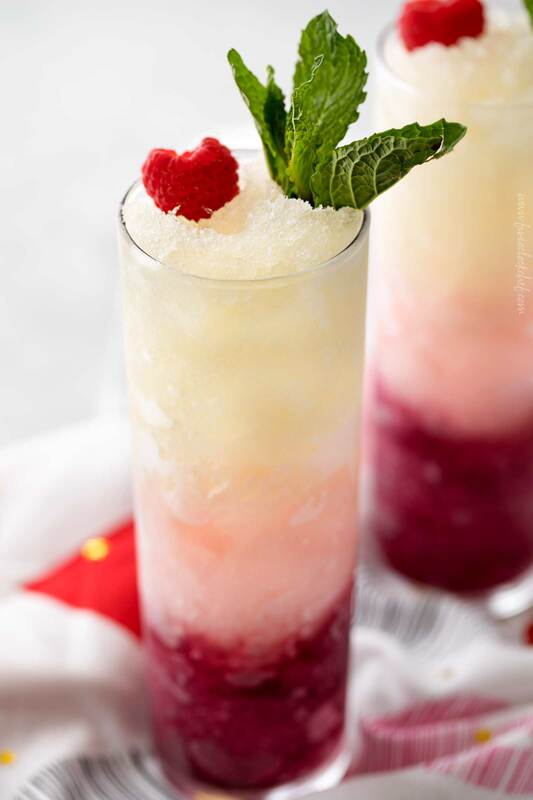 If desired, garnish glasses with fresh raspberries and fresh mint. In a small saucepan, mix 1 cup of granulated sugar and 1 cup of water and heat over MED heat until sugar has dissolved. Bring to a boil and boil for several minutes, then remove from heat and cool completely. When blending wine cubes, use 1/3 of the cooled simple syrup in each of the white, pink, and red layers.